While most know me for my racing accolades and veterinary work, I do have a newer hobby that I was introduced to in 2015. Most days, the smell of race fuel, tires and the roar of engines is my life, but on those rare days off I trade the roar of a V8 for the blast of a rifle or pistol (pun intended). Until 2015, I had never handled or fired a firearm, but I happened to have a professional shooter aka Austin Elbert take me to the range for the first time in my life. He taught me the fundamentals of firearm safety: 1) Treat every gun as if it were loaded. 2) Keep your finger off the trigger and the safety on until you are ready to shoot. 3) Never point a firearm at anything you don’t wish to destroy. 4) Be sure of your target and what is behind it. Having these ground rules made my first day at the range really, really fun! He didn’t hand me a giant rifle like you see in those YouTube videos of girls falling over, instead he started me on a .22 caliber competition pistol that barely moved when I shot it. One thing we figured out at the range is that I am cross eye dominant, meaning I shoot right handed but use my left eye for the sights. I tried shooting left handed but that just was not working. Solution? Tape my left eye! Now I’ll admit it was weird having tape on my glasses but my groups went from coffee cans to golf ball-sized almost instantly! I was hooked, he knew it, I knew it and I couldn’t wait for my next range trip. Having only shot a .22lr pistol, I wanted to try a “real gun” as my co-workers call the larger calibers. Austin brought me to the range to try a few .380acp and 9mm handguns. First, I shot a Bersa .380 that looked a lot like the pistol James Bond carries and kinda liked it but wanted to shoot the 9mm. After learning how to operate it, a competition ready Glock 34 was my first 9mm. The recoil was not scary and I enjoyed it enough to ask for another magazine of ammo. Now for the funny part, well to me at least. I spend most of my time around race cars and now have a fondness for race guns. After shooting Austin’s Ruger 22/45 with a red dot on it, I had to have one and started asking every time we went to a gun shop. Time passed and for my birthday I received my first pistol! I’ll admit that I wanted that Ruger but instead I got a gun to train with, a Ruger SR22. It was cerakoted in NRA blue, a color I LOVE, and has all sorts of safety features. I love shooting it and Austin made me a deal that if I can shoot 50 consecutive bullseyes with it, there is a race gun of my own waiting for me so I have to keep practicing! Now that I am a gun owner, I learned all about gun maintenance and cleaning. I tried all sorts of gun oils and solvents but none really stood out for me. That’s when I found the products from Modern Spartan Systems. My SR22 absolutely rocks when I clean it with their carbon destroyer. The .22lr is a really dirty caliber and just a couple hundred rounds looks like a thousand through a 9mm. The carbon destroyer takes all the gunk out and every time, my pistol looks brand new. In the barrel, those lead bullets leave an awful lot of residue that took me forever and a day to remove with my old solvents. I’d scrub and scrub with a bore brush only to find a decently clean barrel. Not to mention the smell wasn’t pleasant. Copper and Lead destroyer from Modern Spartan systems smells great and it works fast to clean my barrel to a mirror shine in just a few passes from a brush and patches. Girls don’t like those strong odors that make your nose cringe and the copper/lead destroyer fixed that problem for me! Before I put my pistol back together, I always lube it with Accuracy Oil to make sure the slide, barrel and recoil spring are in top condition before my next range trip. A dry gun will stop functioning and jam within a couple shots so I make sure to lube all the important areas with this oil. Words cannot describe how well these products from Modern Spartan Systems really work. If it can clean my dirty .22 well enough to look like it has never been shot, I know it will work great on my next firearm which I hope is a race gun or maybe a nice AR like the competition rifles I have shot. So proud of Austin Elbert, he holds numerous titles including NSCA National Champion & STC National Champion. He is my professional gun trainer. This new world, industry and skill set is all too interesting and above all fun for me. I never knew I would go from a vet and racer to a girl who is now looking at taking handgun classes, getting my concealed carry license and wanting my own set of race guns to compete with. I hear about competitions all over the country from Nebraska to Texas, Florida and right here in my home state of Arizona. 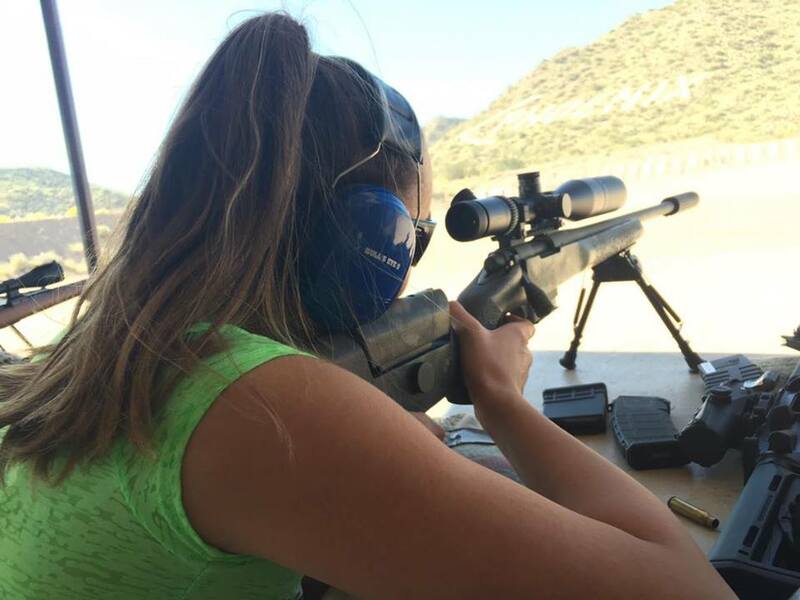 There is a growing number of female shooters in the US and I am glad to add my name to that list. In my opinion, more women should try it! Start with a small caliber like I did, have a competent instructor with you and don’t be scared of the gun. Thank you Austin Elbert, NSSA World Champion runner up and holds 9 STC National Champions, Zone 7 NSSA & USPSA Champion, Arizona Steel Challenge Champion and NCAA National Title with Texas A&M and my gun pro. Thank you Austin Elbert of all your help with this blog. You can follow Austin on twitter @AustinElbert and Instagram at “Millenial Marksman”. Austin is an Aggie, competitive shooter, graphic designer, fan of all things racing, a racer, a hunter, fisherman, musician, and founded the charity, Antlers of H.O.P.E. He is the NSSA World Champion runner up and holds 9 STC National Champions, Zone 7 NSSA & USPSA Champion, Arizona Steel Challenge Champion and NCAA National Title with Texas A&M.